The Finnish Spitz developed from selectively bred Spitz-type dogs that inhabited central Russia several thousand years ago. Isolated Finno-Ugrian tribes in the far northern regions bred dogs according to their specific needs. These small clans of woodsmen relied on their dogs to help them obtain food, and the excellent hunting ability of the Finnish Spitz made it a favorite choice. By 1880, as advanced means of transportation brought diverse peoples and their dogs together, Finnish Spitzes mated with other breeds of dogs, and were becoming extinct as a distinct breed. At about that time, a Finnish sportsman from Helsinki named Hugo Roos observed the pure native Finnish Spitz while hunting in the northern forests. He realized the many virtues of the pure Finnish Spitz breed and decided to select dogs that were untainted examples of the genuine Finnish Spitz in order to try to revive the breed. 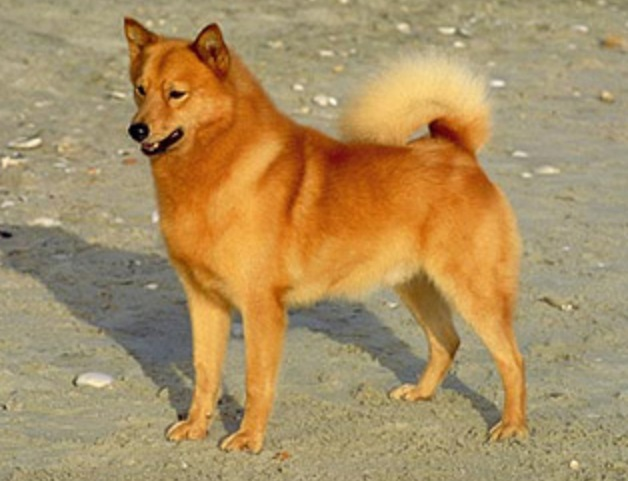 Thirty years of careful breeding resulted in the modern Finnish Spitz; the dogs are descendents of his original foundation stock.